Microtech - Card Readers, CompactFlash, SmartMedia, and connectivity solutions. Welcome to Microtech International, leaders in digital connectivity solutions and personal computer memory upgrades. 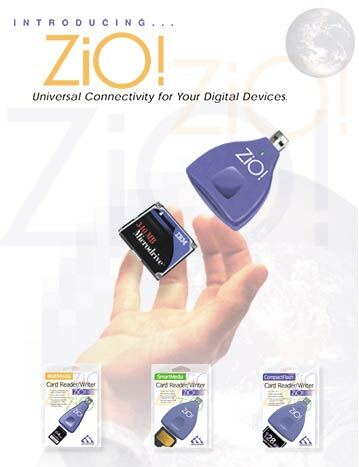 Digital connectivity solutions include PC Card readers, CompactFlash, Smartmedia, and other products which improve the performance, capacity, and flexibility of any digital appliance. Memory upgrades are available for a wide range of desktop and notebook systems, such as Apple, Compaq, IBM, Dell and HP. Call or email with specific questions and for current pricing. Microtech is proud to announce the availability of the IBM Microdrive Deluxe Kit and IBM Microdrive Roadwarrior Kit. These new, value bundles combine the IBM Microdrive (in either 340MB, 512MB, or 1GB capacities), with Microtech's USB and PC Card connectivity solutions, and special software. Microtech announces FireWire CameraMate - card reader. New Microtech USB CameraMate supports Memory Stick. USB CameraMate to be included in Canon in-box printer promotion. Microtech's ZiO! selected for CRN Test Center at Comdex. Microtech introduces FireSCSI Xpress - FireWire to SCSI adapter. New IBM Microdrives available in 512MB and 1GB capacities. New drivers for USB CameraMate available for Win98/2000/ME. Read reviews on the USB CameraMate - the critics just love this thing. © 2000 Microtech International, Inc. All rights reserved.